4 X 12 Victorian Floor Register - Flat Black Discounts Apply ! Victorian floor vents are crafted with all steel construction. This 4 x 12 air register features an adjustable steel damper that allows for air flow control. 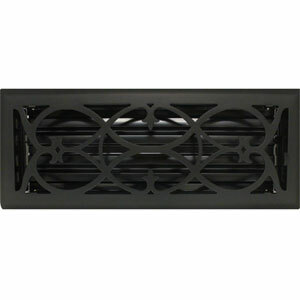 Victorian floor vents have a matte black finish with a protective clear coat to minimize rust and corrosion. Air registers can also be used as a sidewall register when you purchase coordinating wall clips. These Victorian floor vent registers can simply be placed into the duct hole for one step installation. The air registers have a classic Victorian scroll design. ***Hint: When ordering your Victorian floor vent covers, industry standards necessitate that you measure using the interior duct hole opening dimensions and not your existing register's faceplate dimension. These Victorian style air registers are designed fit a 4 x 12 inch hole opening. Victorian floor vents can also be used as a sidewall mounted register. Just purchase these spring clips to attach 4 x 12 air register floor diffusers to the wall. These beautifully crafted Victorian style floor registers are an elegant addition to any home or office, place your order for delivery right to your door.